As promised I am using the same set I shared yesterday, but this time to make a birthday card. I have a friend with a December birthday, so wanted to make her a winter birthday card. This friend was born in Germany and has wonderful memories of family and friends there. 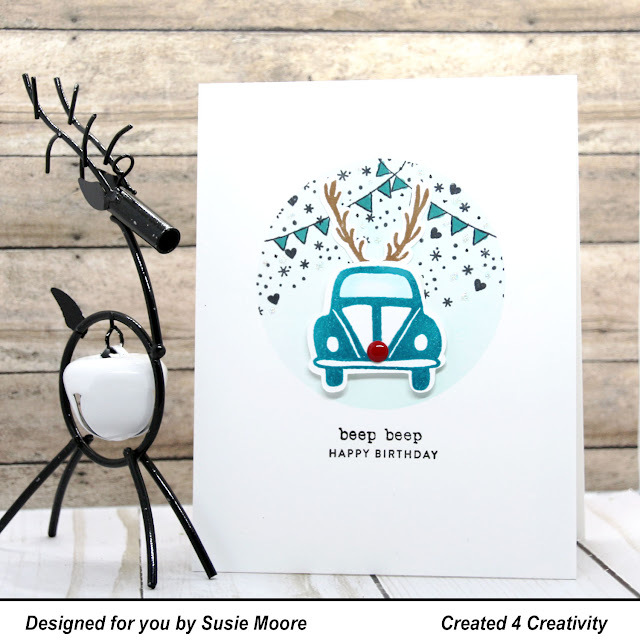 I thought this little reindeer VW bug would make her smile since it's from her homeland. I used the Flora and Fauna Driving to the Holidays stamp set again and used the same masking technique for my blue circle. I added an additional sentiment under the "beep beep". It is from the Simon Says Stamp Tiny Words set. Make today wonderful and I'll see you again tomorrow!